Need more than a candy buzz this Halloween? 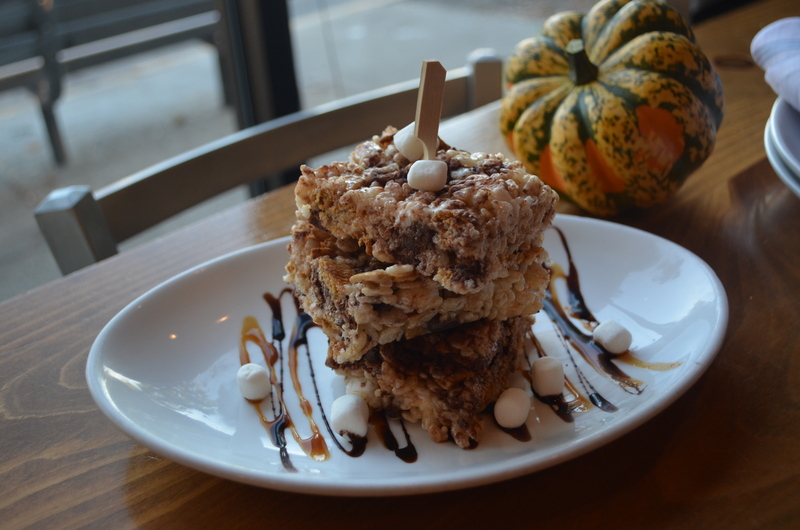 Skip the sugar high and join us for a gourmet Halloween feast. Executive Chef Paul Turano has put an adult spin on childhood favorites with Halloween specials that will be available through October 31st, 2016. 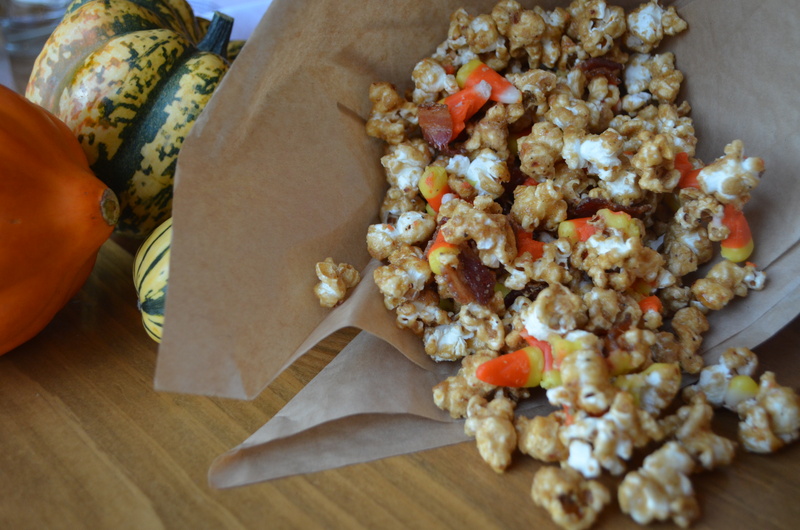 You can order Candy Corn Caramel Popcorn, a deliciously sweet and savory treat that fuses candied bacon, caramel popcorn and candy corn ($5) and Rice Crispy S’mores for dessert!! For a BOO-zy kick, our bar team is shaking up Howl at the Moon, made with Blackberry Moonshine, Bombay Sapphire, Crimson Berry Tea, blackberries, basil, lemon juice and simple syrup and Hocus Pocus, made with Captain Morgan, orange-mango syrup, Peach schnapps, passion fruit and lemon. Both cocktails are $11 and topped with dry ice to give it an extra spooky spike! 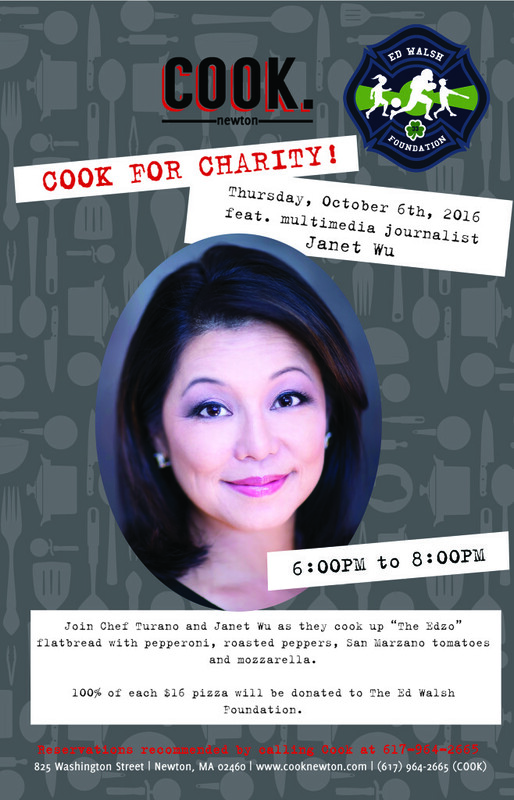 We are welcoming multi-media journalist Janet Wu as part of our continuing “Cook for Charity” celebrity chef series. On Thursday, October 6th, 2016 Janet will trade in her microphone and get cooking with Executive Chef/Owner Paul Turano, where they’ll be serving up flatbreads to benefit the Ed Walsh Foundation. The Ed Walsh Foundation lends a hand to local families coping with tragedy, death or illness, and also supports youth sports, after school programs and organizations like the YMCA and Franciscan Children’s. In addition to our signature menu items, Janet and co. will be serving up “The Edzo” special, a house-made flatbread topped with pepperoni, roasted peppers, San Marzano tomatoes and mozzarella. 100 percent of sales from each $16 “The Edzo” flatbread, affectionately named after Ed Walsh himself, will be donated to the foundation. Janet Wu will be joining the Ed Walsh Foundation for this special event. Janet is a multi-media journalist known locally for her many years as an anchor/reporter for Boston’s NBC station. She currently contributes health reports for two networks and is an adjunct professor at Emerson College. A frequent Op-Ed contributor to The Boston Globe, her work has also been published in The New York Times, The Boston Herald, and several anthologies, including The “Norton Sampler of Essays,” one of the most widely read college textbooks. She graduated from Yale with a dual major in Philosophy and Psychology and earned a master’s degree in Journalism and International Affairs at Columbia University. She was named The Girls Scouts of New England 2015 Leading Woman of the Year and selected as a fall 2016 TEDX speaker. We are welcoming Jen Royle, former sports reporter turned private chef/owner of Dare To Taste, as part of our continuing “Cook for Charity” celebrity chef series. On Wednesday, June 15th Jen will get cooking with Executive Chef/Owner Paul Turano where they’ll be serving up “The Royle” flatbread, a special, a house-made flatbread with figs, ricotta cheese, caramelized onions, pancetta, and a honey drizzle. 100 percent of sales from the “The Royle” flatbread will be donated to Blue’s Bridge. Blue’s Bridge was formed by Danielle Murr of WAAF, after years of working in animal rescue. Named in memory of her loving dog Blue, who acted like a mother to all the animals that Danielle fostered and took in, its mission is to prevent or alleviate suffering by providing resources to animals who are stray, abandoned, sick, abused, or otherwise in need. Blue’s Bridge is dedicated to supporting efforts to provide a safe, loving home for animals between the place they start out and their forever home. As a good friend of Danielle’s and an avid dog-lover, Jen Royle has deep ties with the organization which made it a natural fit. Jen Royle is an Emmy Award-Winning sports reporter. In her 13-year career, Jen worked for The YES Network and CBS radio before moving home to join WEEI and The Boston Herald. She’s covered the Boston Red Sox, New York Yankees, Baltimore Orioles and NFL’s Baltimore Ravens. After becoming a finalist on ABC’s “The Taste” Season 3 starring Anthony Bourdain, Jen joined up with Mario Batali for the launch of Babbo Boston, and is now propelling herself into one of the most creative and innovative private chefs in Boston with her opening of Dare To Taste. In celebration of Passover, we are offering the neighborhood a selection of special dishes on Friday, April 22nd through Saturday, April 30th! 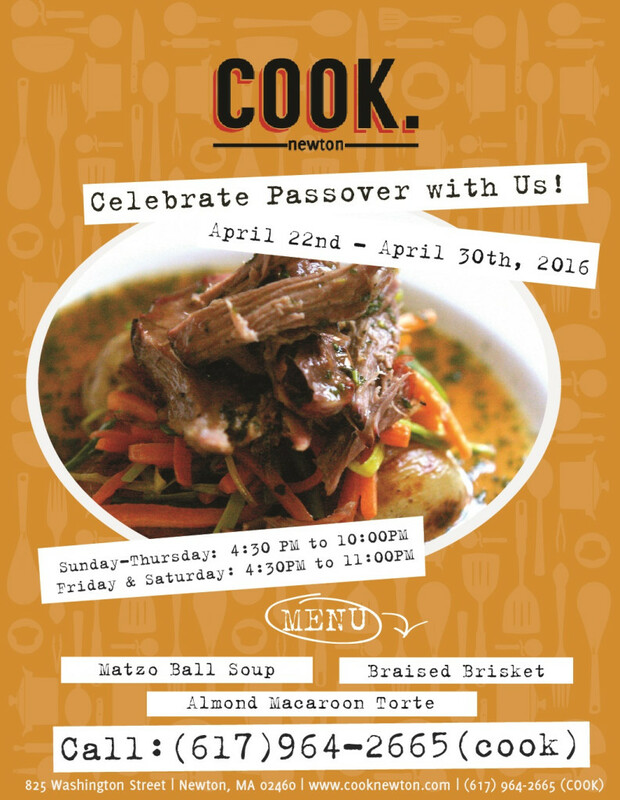 Executive Chef Paul Turano will serve three unique takes on traditional Seder fare including Matzo Ball Soup ($8), Red Wine Braised Brisket with cauliflower mashed, carrots and pearl onions ($23) and Almond Macaroon Torte with chocolate frosting and berries ($8). 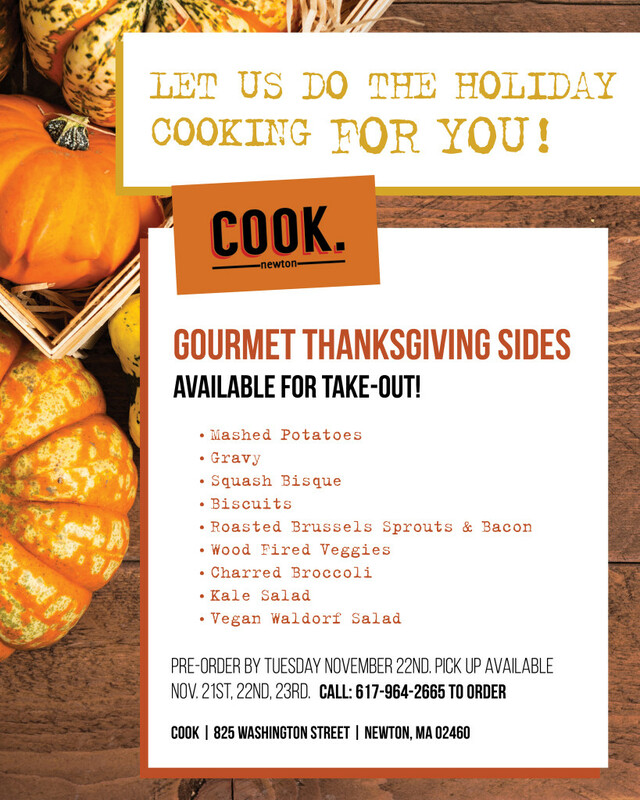 And don’t worry, our regular menu will also be available! As a thank you, I would like to invite each one of you in to one of my restaurants. 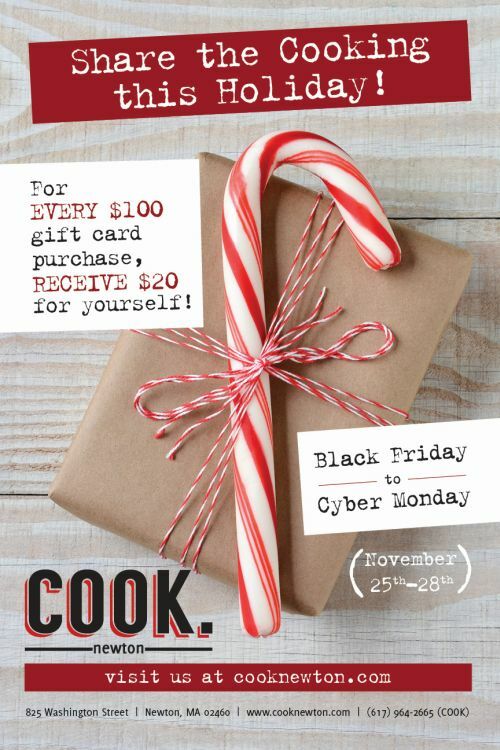 Simply print out your donation confirmation and bring it into Tryst or Cook so that we can give you a gift card (of up to $20 value) in return. 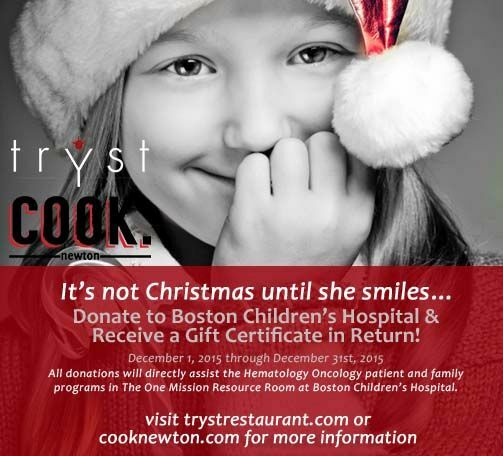 We welcome Kennedy Elsey, co-host of MIX 104.1FM’s “Karson and Kennedy,” as part of our continuing “Cook for Charity” celebrity chef series. 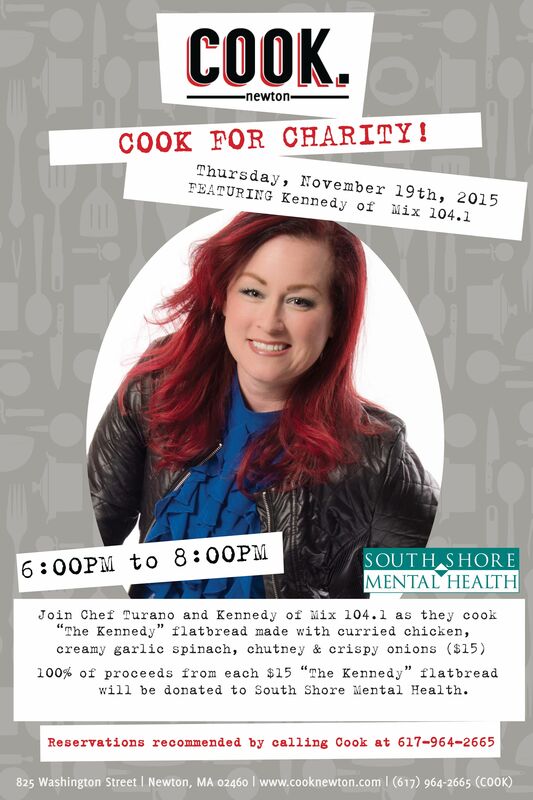 On Thursday, November 19th, 2015 from 6:00PM – 8:00PM Kennedy will roll up her sleeves and get cooking with our Executive Chef/Owner Paul Turano as they serve up flatbreads from the open kitchen, wood-fired grill. In addition to our signature menu items, we will be serving “The Kennedy” special, a house-made flatbread with curried chicken, creamy garlic spinach, chutney and crispy onions ($15). 100 percent of sales from each $15 “The Kennedy” flatbread will be donated to South Shore Mental Health and its “Stop the Stigma” campaign. Kennedy is one half of the “Karson and Kennedy” morning show heard on MIX 104.1FM weekday mornings from 5:30AM to 9:00AM, and every morning she brings Greater Boston entertainment news and her general sass! Kennedy also lives with mental illness. She has worked hard with the amazing folks at South Shore Mental Health to integrate mental health conversation into daily life and help correct the misconceptions that perpetuate attitudes about mental illness. 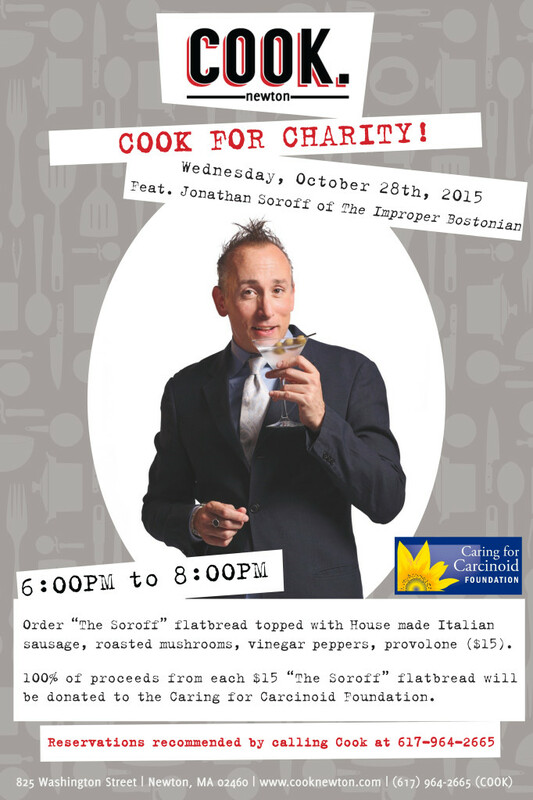 We are delighted to welcome Jonathan Soroff, columnist for The Improper Bostonian, as a part of our “Cook for Charity” celebrity chef series. On Wednesday, October 28th, from 6:00PM – 8:00PM Soroff will get cooking with Executive Chef/Owner Paul Turano as they serve up flatbreads from the open kitchen, wood-fired grill. We will be serving “The Soroff” special, a house-made flatbread with Italian sausage, roasted mushrooms, vinegar peppers and provolone cheese ($15). 100 percent of sales from each $15 “The Soroff” flatbread will be donated to the Caring for Carcinoid Foundation.